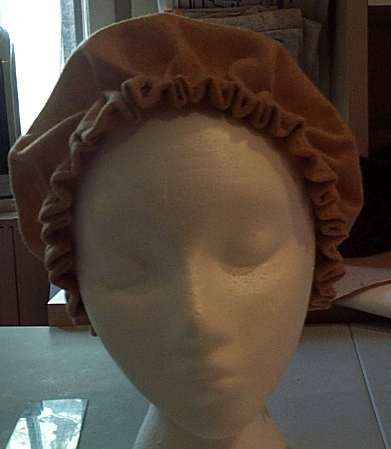 This is a more tailored version of Ye Olde Floppy Gathered Hat. This is a great hat for merchants, or for French or Italien male characters, I think. I don’t like it as well for women. (That’s purely a personal bias.) The following instructions assume that you have already made your Basic Brim Patterns. If you have not, you’ll want to follow the link and do so. Note: These directions do not teach a modern Milliery approach to hat-making. I’ve completely eliminated the use of standard hat sizes and head-size ovals, because I’m assuming that most of the people reading this are *not* trying to set up a hat-making shop. 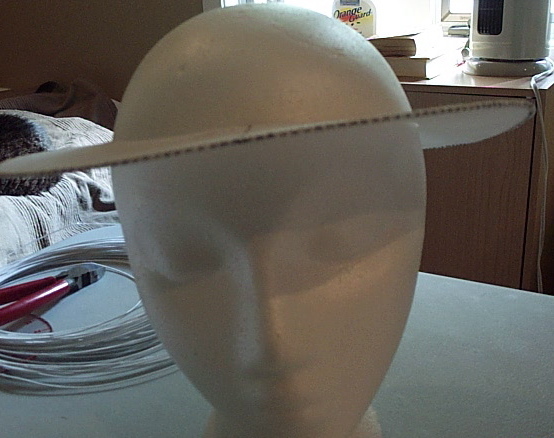 The method I’ve worked out below works, but does not produce standardized patterns sizes unless you are one of the lucky few who actually possesses a standard size head. These crowns start with your Basic Brim Pattern without Seam Allowances. You will also need a piece of fabric (the size depends on, or may determine, the size of the crown you make), a ruler, a marking device (chalk is preferable to the sharpie I use in this demo! ), sewing machine, scissors, thread, and three hand needles and strong buttonhole thread (these last two are for the cartridge pleated hat only). it by marking out from it with a ruler. I generally enlarge by no more than twice the width of my brim. In this case, my brim is 2″, so I am adding 4.5″ (2×2″ + 1/2″ seam allowance). When you finish marking, you’ll have a great big oval. 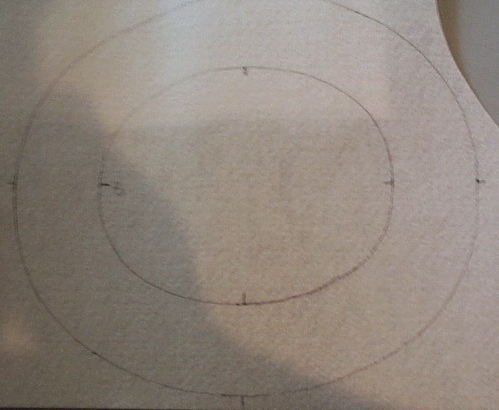 Using your ruler, transfer the Side and Front/Back marks to the outside edge of the oval you just marked. 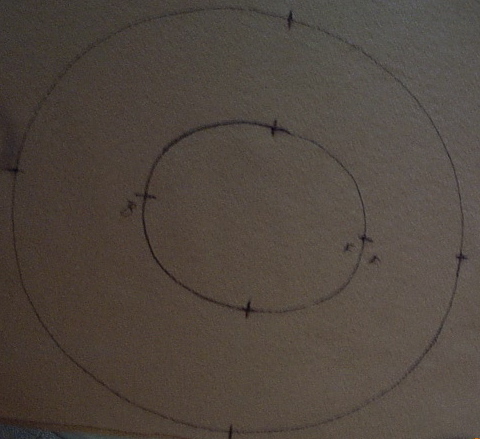 Cut this oval out. for your cartridge pleat stitches. I find it easiest to work all three lines of stitch simultaneously. Thread three needles each with a long doubled piece of buttonhole thread. 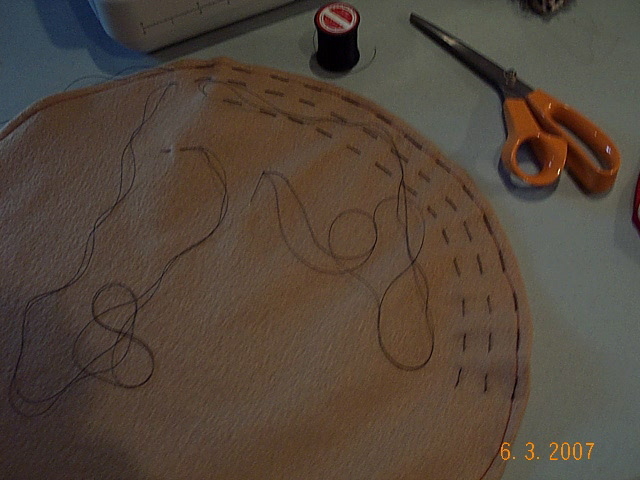 Starting at the outer edge of the crown, sew large running stitches (about 3/4″ long) for 10″ or so along the stitching line. Start the second needle 1/2″ in from the first, matching the stitches up with the first line. Here’s the tricky bit: these stitches will be a hair shorter than the first row. Since we’re working with an oval, think of these stitches like they’re hitting on the edges of thin little pieces of pie — the closer they are to the center, the shorter they are. Start the 3rd needle 1/2″ in from the second. 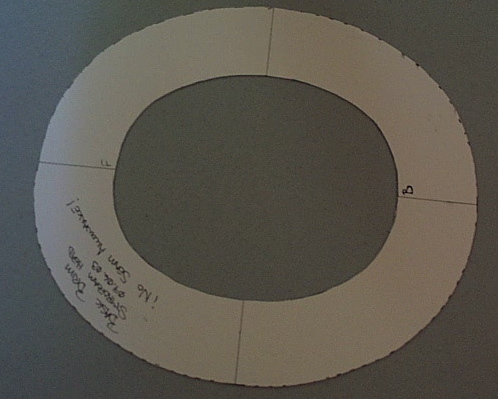 Repeat in 10″ segments around the crown. a standing shape, instead of a big flat oval. 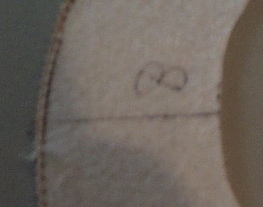 Use the Basic Brim Pattern without Seam Allowances to check the size. When you’ve got it, knot the gathering threads securely inside the hat. which is great so long as you never, ever get it wet. A lot of hats made for ren faire purposes use plastic canvas as an interlining (an idea that nearly caused my Millinery teacher to faint) — great, but kinda heavy, and hard to go through with a sewing machine, and it can show through the outside of the hat if you’re not careful or the hat gets wet. Trust me, because I’ve don this many a time. 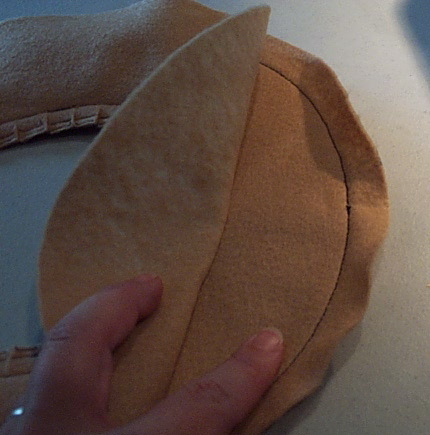 A double layer of craft felt sized with regular Elmer’s White Glue will work in a pinch. 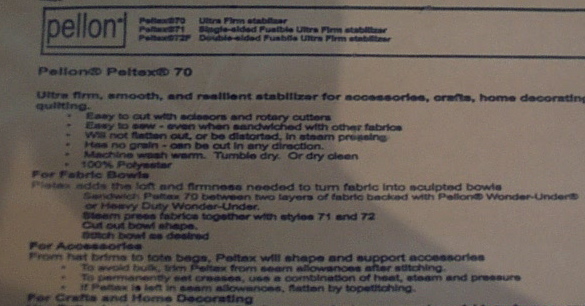 I’m going to use a Pellon product called PelTex, which is a super heavy duty sew in interfacing. It’s expensive, unfortunately — 8$/yd, last I checked, but you can get a lot of brims out of a yard. As well as your interfacing, you will need about a yard of Millinery Wire, a cutting pliers, your Basic Brim Patterns (both with and without seam allowance), enough fabric to lay the brim with seam allowances out twice, thread, sewing machine, hand sewing needles (preferably a small curved one), scissors, pins, and some patience. First, we will prepare the stiffened interlining. 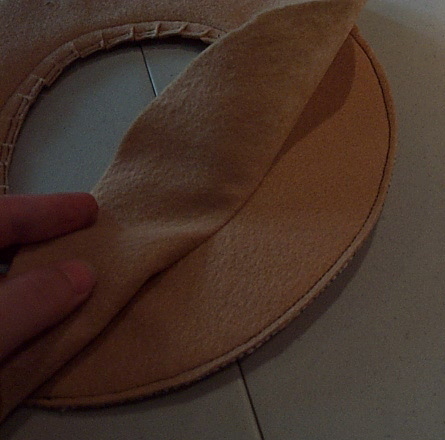 Lay your Basic Brim Without Seam Allowance pattern on your interfacing (again, I’m using PelTex). Trace off the pattern, makings sure to transfer the Side and Front/Back markings. 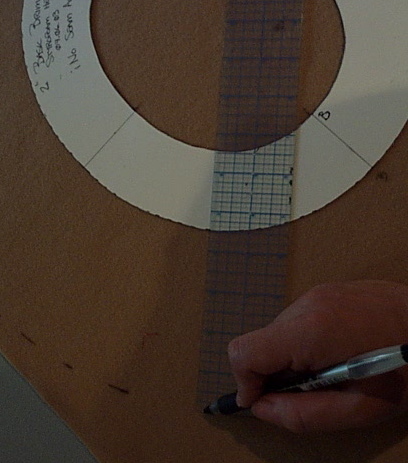 Cut the piece around the outside, then carefully remove the inside oval as well. Do not cut through the brim. 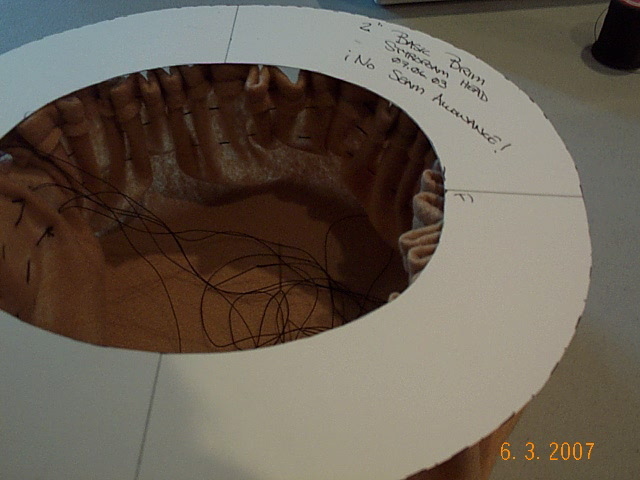 The next step involves securing the Millinery Wire to the edge of the brim interlining. You will need the wire and the cutting pliers. 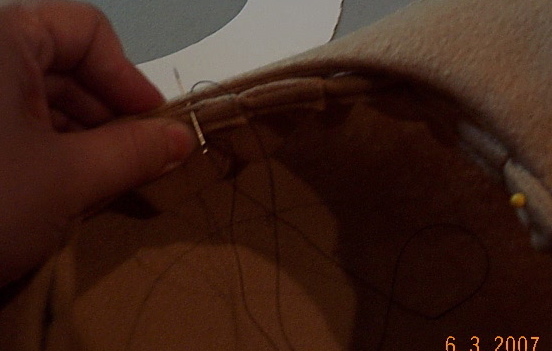 If you are using plastic canvas, you are probably best off attaching your wire by hand, using an overcast stitch. (It will be slow and annoying, because the little pokey bits on the canvas will catch the thread all the gosh darned time. 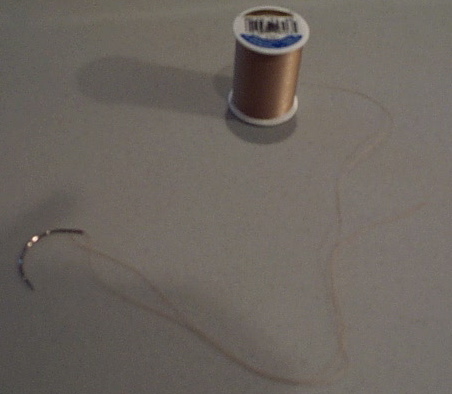 If you’re using a brim interlining that can go through a sewing machine safely, you can put the wire on by machine. 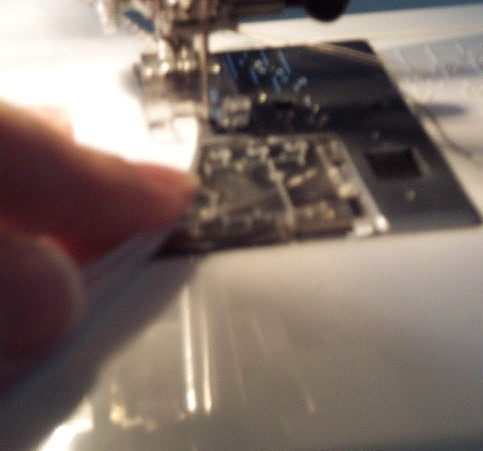 You’ll want to set your machine for the widest zig-zag stitch it has, at a stitch length of 2-3. 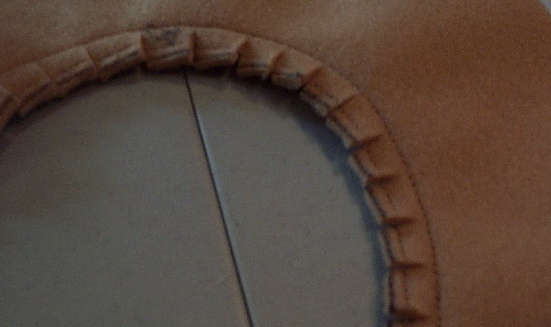 Line the edge of the brim and the Millinery wire up with the center of the foot. Start stitching at the center back of the brim, and go slowly. You want to make very, very sure that you don’t hit the wire with the needle, as it will break the needle. Now, I’ve had a piece of broken needle hit my face literally 3/4" from my eye, so I’d really recommend safety goggles when sewing over wire (or around metal bonings). Go slowly, allow the machine to feed naturally, and keep everything lined up and you should be fine. If you’re nervous at all, go ahead and do it by hand with a hand overcast stitch. I like to cut the piece of wire off from the main roll after the brim is mostly wired. (This prevents annoying measuring errors.) 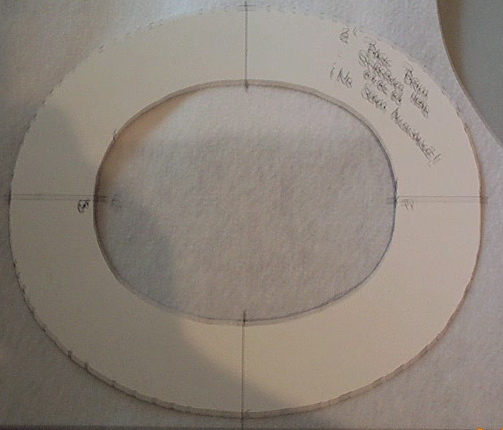 About 2" before you complete the brim, cut your wire so that you will have about an inch of overlap. Where the wires overlap, you’ll simply continue to zig-zag with them right next to eachother, again being very careful not to hit wire with needle. I don’t backtack this, because the inch overlap is more than sufficient to keep things from pulling out. Besides, this will be totally encased in the brim and protected from wear and tear. Here’s a closeup of the center back join in the wire, in case the description didn’t work. To cut the fabric to cover the brim, you’ll want to use your Basic Brim Pattern With Seam Allowances on a double thickness of fabric. It is helpful to have the right sides together. Trace out the pattern, being sure to transfer Side and Front/Back marks. Pin the layers together inside the brim. Cut the piece around the outside edge only. 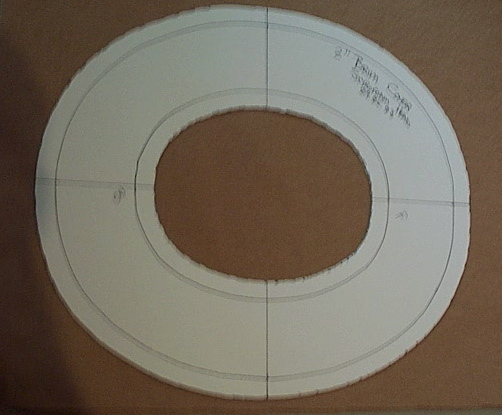 We will be working the center oval seam before we cut out the middle bit. 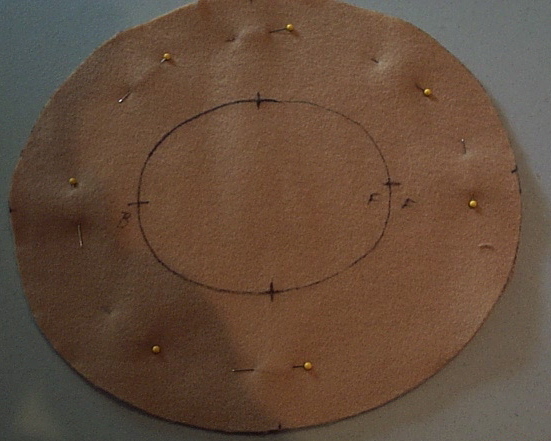 With right sides together, sew around the inside oval once, about 1/4" inside the oval line. (This puts your stitch line half way inside of your seam allowance.) These stitches stabilize the actual seam, so no stretching occurs, and help to control the seam allowance fabric so it’s easier to turn the brim around the interlining. You really don’t want to skip this step. 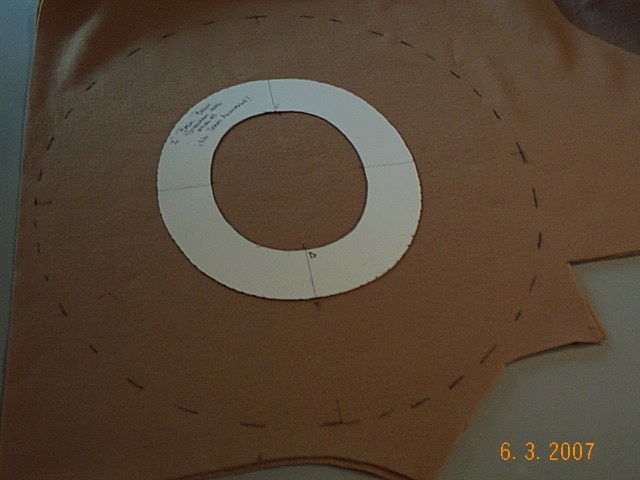 Cut the center oval out along the line marked from the pattern, then sew around at the normal seam allowance. Snip the seam allowance straight in, and almost to, the innermost line of stitches. Do not snip through these stitches! 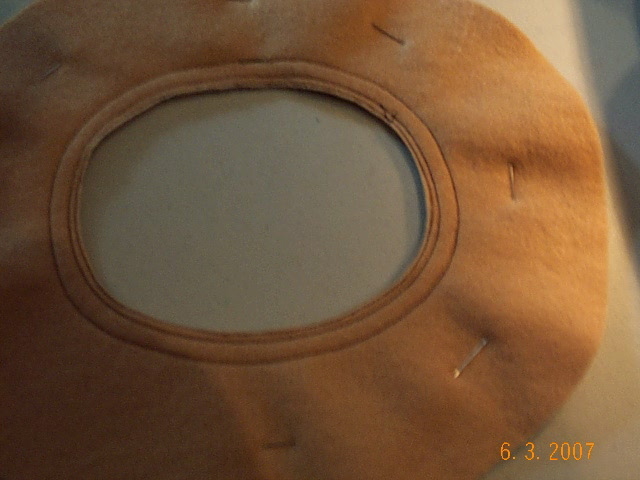 Lay the finished brim interlining on the brim fabric, lining up the Side and Front/Back marks. 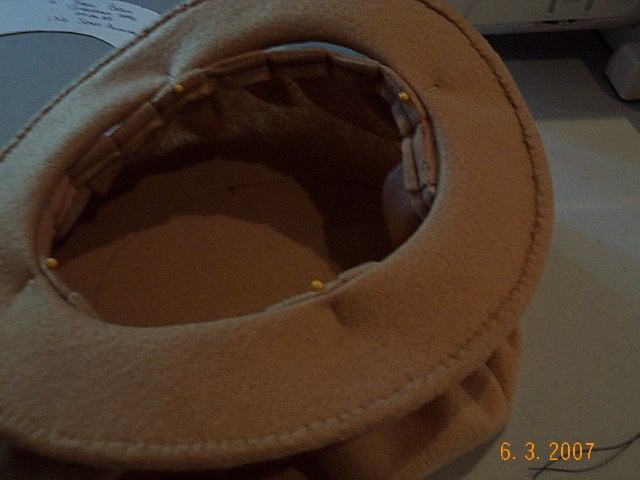 You want to pin the topmost layer of the brim to the interlining, leaving the bottom layer free. You want to match the inner line of stitches on the brim fabric with the inside edge of the brim interlining. This might take some gentle persuasion, but they are made from the same basic pattern so they should go together if they’re lined up correctly. 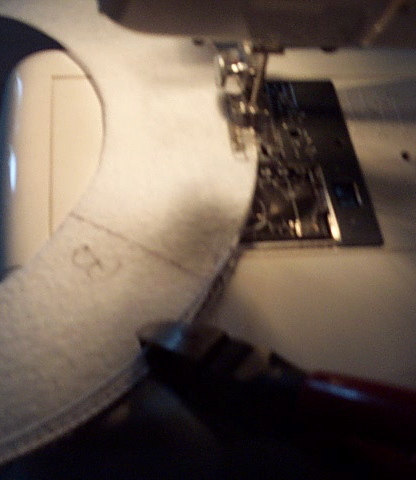 Sew the brim interlining to the wrong (top) side of the top layer of the brim by machine. (Unless you are using plastic canvas — you guys do this by hand.) You want to sew less than 1/8" inside the brim from your wire with a straight stitch. It’s very important that this stitch stay very close to the wire, or you will be unable to hide it when you finish the brim. 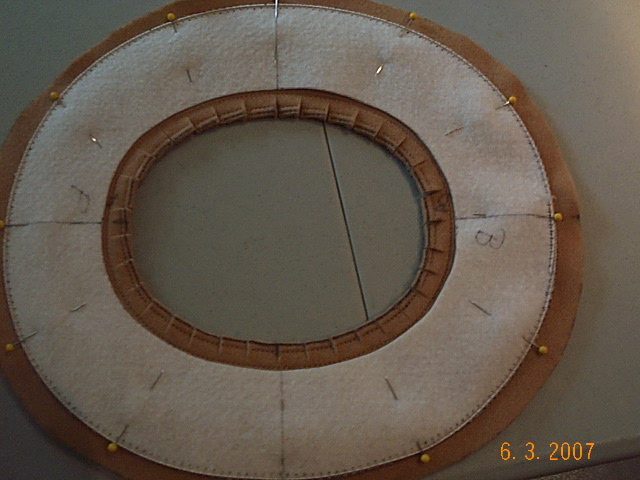 At this point, if you turn the whole assembly over, this is what you should have: One free floating layer that is only attached at the center, one oval that is attached at the center and sewn around the outside edge to the brim interlining, and one brim interlining (likewise sewn around the outer edge). If this looks like what you’ve got, you’re clear to go ahead. Trim the seam allowance of the brim layer that is sewn to the interlining. Trim ONLY that one seam allowance. 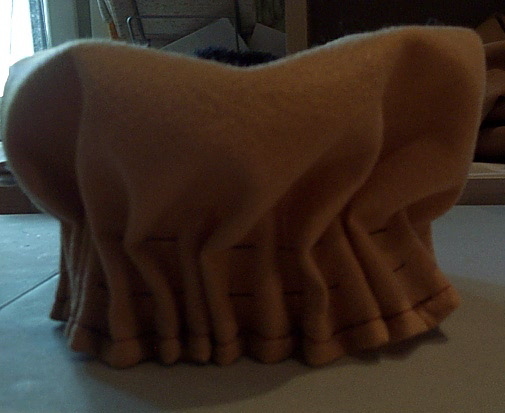 Once that seam allowance is trimmed, you can turn the brim around the interlining. You’re literally going to turn the free floating piece of labric through the central oval of the brim. That should leave you with a flat brim. The center oval’s seam allowance will be covered by the fabric that you just turned through. The seam allowance of the fabric that was turned through will be visible past the edge of the layer that’s sewn to the interlining. And now for the "fun" part. You will need a heavy supply of both patience and pins here, because we’re going to roll that seam allowance over the edge of the brim and cover the seam that attaches the interlining with it. And we’re going to do it by hand. Starting at one side, pinch the seam allowance of the free piece of brim inward so that it butts square up against the edge of the hat. Roll the pinched seam allowance down over the edge of the brim and secure with a pin. I find it easiest to do this twice, about an inch apart, and then work the little teepee that forms between the pins into a smooth roll with my thumbnail. Do anything that works for you, but take care to get a nice, smoothly rolled seam allowance that covers the stitch line. You should be pinning about every half inch. Really, it’s a beastly annoying task and my least favorite part of the hat. But it looks so nice when you’ve got it all finished….. 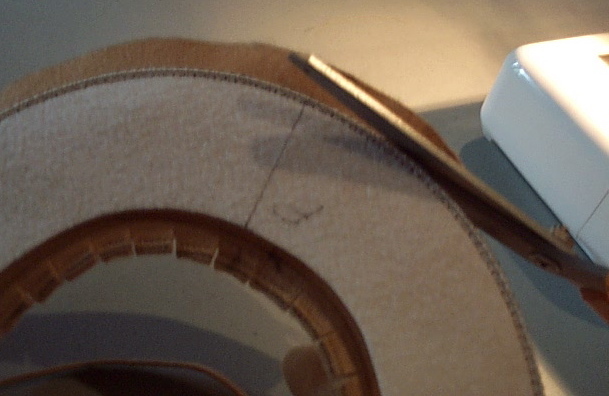 Here are the only tools you need to finish the brim: a small curved needle and thread. 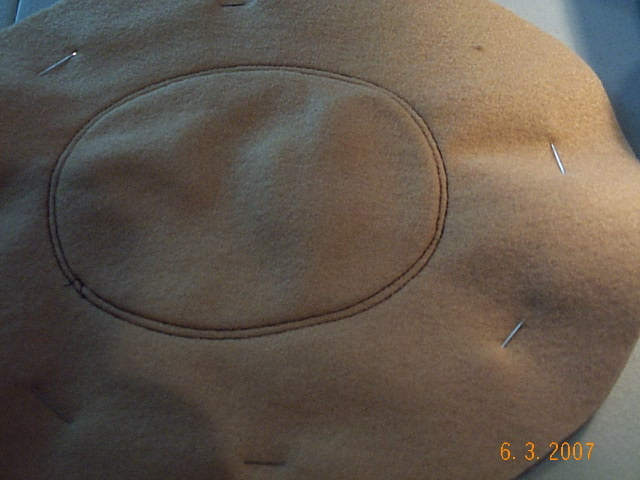 If you don’t have a curved needle, this can be done with a straight one, but it’s more difficult because you want to hide the stitches as much as possible and it’s very hard to get into that curved seam with a straight needle. If you’ve not used a curved needle before, you basically hold it perpendicular to your work. Use the tip to pick up a small amount (a few threads on a woven) of the flat brim fabric, the push the curve through to pick up a small amount of the rolled edge of the seam allowance. You should end up with a small straight stitch that’s barely visible. You’ll want to make your stitches small and quite close together, but not right on top of eachother. 1/8" to just shy of 1/4" apart will do. I usually have 3-4 stitches per half inch. I also put in a knot every 2" or so, just a small one, because I’d hate to have the thread snap and have to start all over. I’m paranoid like that. When you’re joining up a Brim and a Crown by hand, you’re doing it because the seam is quite bulky or will not pass flat through the machine. That in mind, I find that it’s often helpful to pin the brim to the crown (top of Brim to outside of Crown) at the Side and Front/Back marks. 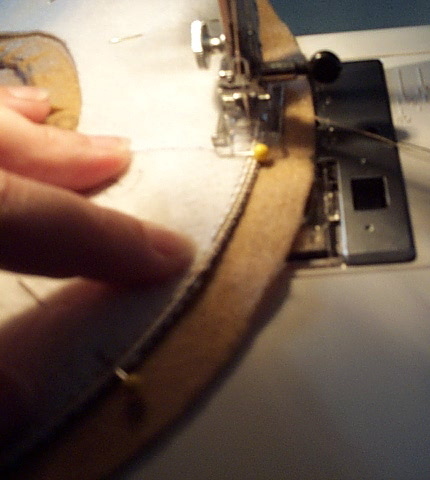 To sew the Crown and Brim together, you want to take small stitches that pass through the very bottom of the Crown and the very edge of the Brim. The easiest way to accomplish this is to press the Brim down against the side of the crown while you pass the needle through both. Keep your stitches small and tight, and knot every 1-2". Remember, the join between the Crown and Brim is the part of the hat that takes the most strain. 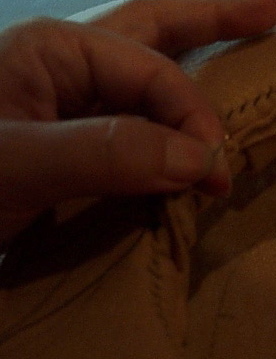 by pulling it through the seam allowance inside the crown. Yay! How cool does that look? I just wanted to thank you for such amazing clear and easy to follow instructions. I just made one of these in miniature, for the Shrewsbury Renaissance Faire, and it was much easier than I anticipated. Thank you for such awesome directions! I just finished my first hat… thanks for your efforts! Well done! I would love to see a pic. Hi. 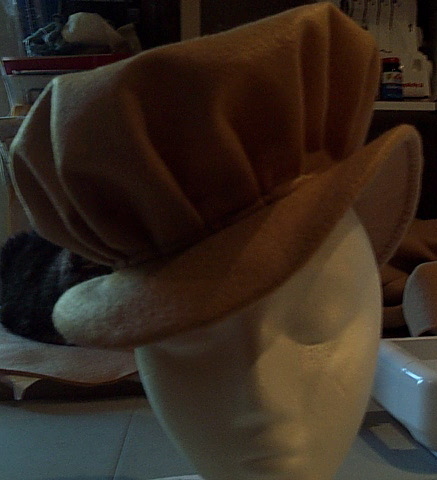 Just wondering what thickness Millinery wire do you recommend for this hat? That depends on how heavy your fabric is and how wide the final brim will be. 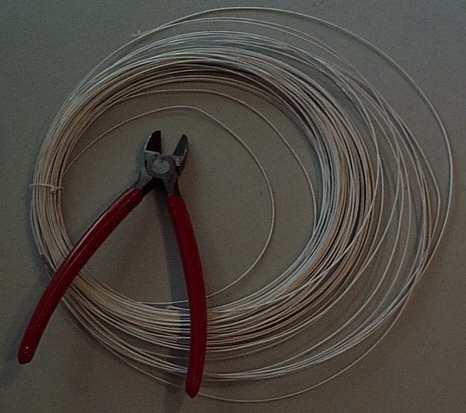 I use 1 mm cotton covered wire for just about every brim I wire (except some really special theatrical applications). I’m not sure it’s always the right choice, it’s just what I have on hand.